A longtime dream to tell the story of the black experience in America at a site on Charleston’s waterfront just took a big leap toward becoming a reality. 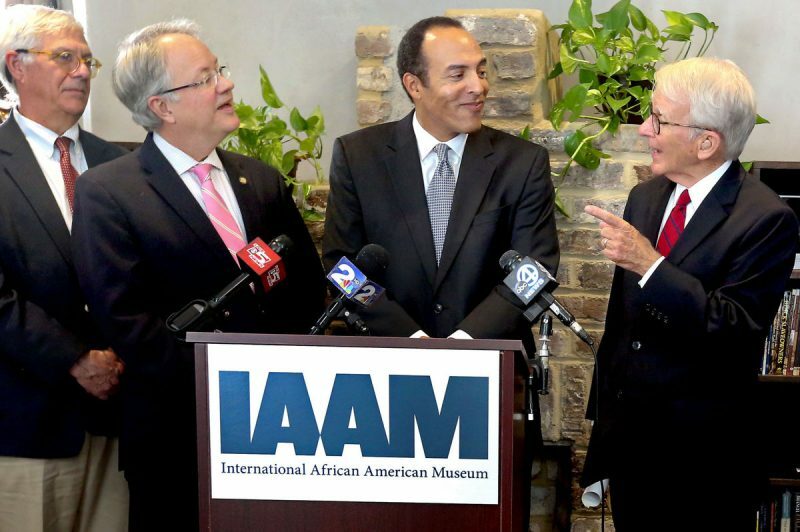 The International African American Museum announced Tuesday it will receive a $10 million grant from the Lilly Endowment, one of the country’s most prestigious foundations. It’s by far the biggest donation ever to the project. “This really delivers the message that after all these years, this is really going to happen,” Museum President and CEO Michael Boulware Moore said after the announcement. Another $9 million in private donations is needed for construction, which is scheduled to start early next year. Charleston Mayor John Tecklenburg also commented on the significance of the grant. “I think this gift from Lilly foundation will give us the momentum and incentive for some of these other requests that are out there for them to pile on, and we’re going to take this thing over the top,” he said. Former Mayor Joe Riley announced the vision for the museum in 2000 during his state of the city address. The museum will be built next to the Maritime Center at Gadsden’s Wharf, where many enslaved Africans entered America. The opening is planned for early 2020. Riley has continued beating the bushes for support even after retiring from office two years ago. Tuesday’s announcement started 2½ years ago when Riley approached Greg Ballard, then the mayor of Indianapolis, and asked him to help arrange a meeting with Chris Coble, Lilly’s vice president of religion. They met, and then Riley and the endowment’s program directors walked the site in Charleston. They also visited Emanuel AME Church, where nine black worshippers were killed by a self-avowed white supremacist in a mass shooting in June 2015. Lilly representatives were impressed by the “sacred” location, adding that religion “is an inescapable dimension of this story,” Riley said. Half the grant will go toward building the museum, and another $4 million will start an endowment fund. The remaining $1 million will be split between a changing exhibit of African American religion and music, and efforts to engage congregations and faith-based communities. Tecklenburg said the construction schedule and opening date would remain the same even if the rest of the money were raised tomorrow. A third of the museum’s estimated $75 million cost will come from private donations and a third will come from the state. The city and county of Charleston will contribute the rest. The state has given $14 million, and lawmakers have promised the other $11 million once the private money is raised, Riley said. The museum has announced several other major donations this year, including $500,000 each from Wells Fargo bank and tire-maker Michelin, and $250,000 each from AT&T, Bennett Hospitality and TD Bank. Previous post Read the Roots’ Exclusive Interview with IAAM CEO and CFH Leader.